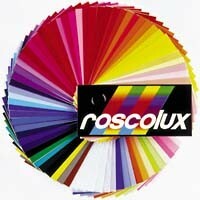 Roscolux is comprised of two types of plastic. More than 65% of the line is made from co-extruded polycarbonate plastic. The remainder of the line is deep dyed polyester. Sheets are 20" X 24". Please note that the 2000 Storaro colors, 3000 Cinecolors/diffusion, and 4000 CalColors are located under the Cinegel tab. Filters create color by subtracting certain wavelengths of color. Thus, a red filter absorbs blue and green, allowing only the red wavelengths to pass. The process is subtractive, not additive, so the light source must emit a full spectrum. The Rosco swatchbook provides detailed information on the spectral energy curve of each filter. The curve describes the wavelengths of color transmitted through each filter. For example, Roscolux 342 transmits approximately 40% of the violet and blue energy of the spectrum and 75% of the orange and red energy. It absorbs all energy in the yellow and green range. To prolong the life of a color filter, align your ellipsoidal lamp to a flat field focus. (Get rid of the hot spot.) You can increase the distance between the lamp and the filter by using a top hat or barn door. In extreme cases, try Rosco Heat Shield or Thermashield to prolong the life of your filters. The spectral energy distribution curve of each Roscolux filter describes the wavelengths of color transmitted through the individual filters. For example, Roscolux #342 transmits approximately 40% of the violet and blue energy of the spectrum and 75% of the orange and red energy. It blocks all energy in the yellow and green range. The "Trans." Percentage refers to overall light transmission that is allowed to pass through each individual filter. Click on this icon shown next to each color filter to view its SED curve. Strong red amber. Excellent for fire effects. (Transmission = 20%). Afternoon sunlight. Lamplight and candlelight. Tends to depress color pigment values. (Transmission = 54%). Useful for amber cyc light and late sunsets. (Transmission = 43%). An amber with some green content. A good sunlight transition color that shows the progression of the sun from white or yellow to amber later in the day. (Transmission = 39%). Very useful as a backlight. Dramatic specials and firelight. (Transmission = 26%). Provides a romantic sunlight through windows for evening effects. (Transmission = 32%). Very deep amber. Red with a touch of blue. (Transmission = 22%). Good for firelight or special effects. Use when red with higher yellow content is needed. (Transmission = 14%). Vibrant red. Good alternative primary. (Transmission = 12%). Good red primary for use with three-color light primary systems in cyclorama lighting, footlights, and border lights. (Transmission = 4%). Excellent for general area washes. Gives overall warming effect to skin tones. (Transmission = 44%). General wash. Good for follow spots. (Transmission = 46%). Warmer and lighter than 31. Good for fair skin tones and to emphasize romance. (Transmission = 68%). Deepest of the salmon pinks. (Transmission = 28%). A tropical pink that is good for musicals or concert lighting. A good backlight color. Interesting accent color. Good for a splash of sunset color. (Transmission = 38%). A pale almost colorless pink. (Transmission = 65%). A pink tint that is excellent for most skin tones. A good color for warm area lighting. Lighter than 33. (Transmission = 71%). Useful for bright musicals. Creates a happy atmosphere. (Transmission = 45%). Similar to 33, but slightly deeper. (Transmission = 66%). Blue Pink, Use in general washes and toning. (Transmission = 56%). A cool pink excellent for washes and general illumination. A good follow spot color. A component of early morning sunrise. (Transmission = 55%). A deep, saturated pink created for musicals and specials. Excellent for down and backlighting. (Transmission = 15%). Similar uses to 23 but a bluer color. (Transmission = 34%). Light orange with high blue content. (Transmission = 24%). More red than 342. (Transmission = 8%). Extremely intense, hot pink. Produces strong washes of color for concert and dance. Combined with a complimentary color like turquoise, will create a dynamic, sculptured effect. (Transmission = 16%). Rich, hot pink. Electric in effect with rich saturation. (Transmission = 28%). A bright, dark pink excellent for musicals or rock and roll concert lighting. A good color for creating fake neon effects with fluorescent tubes. (Transmission = 33%). Musical pink. Lush accents. Very versatile color. (Transmission = 26%). A vibrant, almost fluorescent pink with a cool component. Traditionally important as a special effects color in the Broadway musical. Follow spot and dance applications as a modeling color. (Transmission = 21%). Use on scenery and background effects. Adds tone and modeling to scenery. (Transmission = 8%). Similar uses as 45 where more saturation is needed. (Trans.= 6%). (Transmission = 6%). A warm, red purple that recalls the Jazz Age. Useful for creating saturated color effects in live performance situations-club and musical group lighting. (Transmission = 5%). The original Congo Blue. A purple-blue, highly saturated, for modeling effects and non-realistic atmospheres. (Transmission = 2%). Midnight and moonlight illusions. Enforces mysterious mood. Useful for evening cyc wash. (Transmission = 9%). Helps maintain white light when dimmer is at low intensity. (Transmission = 62%). The slightest blue tint. Excellent for eliminating amber shift when lights are running low on a dimmer. Good for cool area light. (Transmission = 52%). Excellent for general area washes. Very light cool tint of blue. (Transmission = 66%). A sharp cold blue that stays clean when dimmed. (Transmission = 18%). Helps maintain white light when dimmer is at low intensity. (Transmission = 54%). A soft clean blue. Good choice for cool area lighting. Can also be used to shift the amber of lamps running at low dimmer levels. (Transmission = 32%). Good for creating an overcast look and feeling. (Transmission = 56%). A pale blue-green color. Can be used for area lighting. A soft backlight color. (Transmission = 52%). Useful for beams of realistic moonlight. (Transmission = 26%). A clean light red blue. Creates naturalistic daylight fill color. Good cool area light. (Transmission = 32%). Useful for achieving depressed moods and dull skies. (Transmission = 35%). Clean blue with more red than 364. A true color correction filter for film. Converts 3200°K to 5500°K. Good for area light. (Transmission = 36%). A pale green shade of blue; good for area or general washes. Creates an icy feeling on stage. (Transmission = 67%). More green than 65. A crisp light blue-green. (Transmission = 32%). Excellent sky color. Useful for cyc and border lights. (Transmission = 26%). Clean medium blue. Good for sky color or moonlight. (Transmission = 20%). Excellent for early morning sky tones. Popular among designers for cyc and borders. (Transmission = 14%). A silvery blue, used for front light and moonlight. (Transmission = 16%). Used for dramatic moonlight effects. (Transmission = 18%). Slightly more green than 69. (Transmission = 22%). Useful for very light midday skies. Occasionally used for general cool tint. (Transmission = 45%). Good to create eerie and mysterious effects. Good for night time water effects. (Transmission = 31%). Occasionally used for general cool tint and non-realistic washes. (Transmission = 30%). Less red than 3202. (Transmission = 35%). A clean slightly green blue. Good moonlight fill. (Transmission = 44%). Slightly lighter and less red than 3204. (Transmission = 55%). Good for fantasy, moonlight and water effects. (Transmission = 28%). Slightly lighter and less red than 3208. (Transmission = 72%). Fantasy moonlight. Crisp and beautiful. Popular as a backlight or sidelight in contrast to area light. (Transmission = 4%). For enhancing water scenes or deep sea environments. Greener than 73. (Transmission = 26%). Less green & cresper than 76. (Transmission = 11%). A crisp, clean blue-green. Useful as a water effect or as a sidelight for dance. (Transmission = 32%). Distinctive greenish blues. Useful for romantic moonlight. (Transmission = 9%). A soothing green blue. More blue than 76. A good conventional moonlight color. Interesting tonal color. (Transmission = 6%). Medium neutral lavendar. Good wash light. (Transmission = 11%). A rich clean red blue that warms to lavender when dimmed. (Transmission = 19%). A rich clean red blue that warms to lavender when dimmed. (Transmission = 15%). Cool clear bright blue. (Transmission = 8%). Primary blue. For use with three color light primary system in cyc lighting. (Transmission = 9%). Saturated color created for Lighting Designer Mike Baldassari - It's Double #3220 Double Blue (Transmission = 6%). Deep rich blue with slight amount of red. (Transmission = 6%). Deep blue more saturated than Roscolux 385. Good for dark night skies or for a backlight color. A great color for rock and roll concert lighting. (Transmission = 1%). Good for non-realistic night skies. (Transmission = 4%). A deep romantic blue on the red side. (Transmission = 4%). A true blue with excellent punch for bright skies. Lovely contrast to pale blues; adds coldness to shadows. (Transmission = 14%). An intense red-blue. Deeper than 83 with a little more red. (Transmission = 2%). Deeply saturated blue with a hint of red. (Transmission = 3%). Excellent for non-realistic backgrounds. A very saturated blue. Pronounced red content that will shift toward purple when dimmed. Low transmission but will offer a striking contrast when used as a background with lighter accents. (Transmission = 4%). Good for dense foliage and woodland effects. (Transmission = 56%). Sunny spring mornings. (Transmission = 85%). Sunny spring mornings. (Transmission = 82%). A yellow-green similar to the color emitted by gas lighting fixtures. Appropriate for period pieces: i.e. La Boheme, and useful for creating reflections from fields and meadows. (Transmission = 76%). Useful for mood, mystery and toning. (Transmission = 45%). Suggests reflected light from dense foliage. A brilliant cyc lighting color which will work for chroma-keying effects in television production (Transmission = 40%). Alternate primary where higher transmission is desired. (Transmission = 13%). Primary green for three color primary system. (Transmission = 7%). Useful for mood of mystery and for toning scenery that has been spattered in blues. (Transmission = 59%). Cyc Wash. Good Costume color. Magical on skin. (Transmission = 20%). Useful for mood of mystery and for toning scenery that has been spattered in blues. (Transmission = 35%). An exagerrated green. Nearly double intensity as 93, less blue than 95. (Transmission = 14%). Fantasy and unrealistic effects. Unflattering on skin tones. (Transmission = 25%). Used on foliage in moonlight areas or for creating a mood of mystery. Good for toning scenery painted in blues, blue-greens and greens. (Transmission = 15%). A medium green-blue which can be used as a mystical special effect color. Also an interesting side or backlight color in concert lighting. (Transmission = 13%). To simulate unnatural sunlight before and after a rainstorm or tornado. (Transmission = 98%). Neutral greys to reduce intensity without affecting color temperature. (Transmission = 50%). A half stop neutral density. (Transmission = 70%). Helpful in balancing brightness of lamps of different wattage. (Transmission = 25%). A very neutral filter to balance brightness of lamps of different wattage without changing the color temperature. (Transmission = 40%). Warms light and reduces intensity. (Transmission = 35%). Frost. Changes ellipsoidal to fresnel beam pattern. (Transmission not available). Offers softened beam.Changes ellipsoidal into flood or scoop. (Transmission not available). Changes ellipsoidal into flood or scoop. (Transmission not available). Has twin qualities of wide diffusion and warm center. (Transmission not available). Creates a slash of light for stretching light along stairs, tables, cycs, etc. Diffuses while maintaining compactness of beam. (Transmission not available). Good on scoops for cyc lighting. (Transmission not available). Removes lens shadows. (Transmission not available). Densest diffusion of the series. Spreads the light almost 1800. (Transmission not available). Lighter than 100-103. An excellent diffuser for HMI, CID and CSI sources softening the beam slightly while maintaining excellent transmission. (Transmission not available). Good for striplights and specials. (Transmission not available). A very light frost; good on followspots and PAR lamps. (Transmission not available). A range of diffusion materials adapted from cinematography-used for softening the shadow of the beam while maintaining a relatively high color temperature because of the use of ultra-white pigments in the manufacturing process. (Transmission not available). Lighter than 114. Recommended for followspots and slight diffuse focus for ellipsoldals. (Transmission not available). Combine a color with Matte Diffusion. Aids in broad, even illumination of cycs and drops. (Transmission not available). Combine a color with 104 Tough Silk. (Transmission not available). Useful in border and striplights to prevent scalloping; helps illuminate cycs and drops. (Transmission not available). A secondary color combined with 104 Tough Silk. (Transmission not available). Retains the diffusion properties of 104 but with less light loss. (Transmission not available). A lighter version on the popular 112 Opal Tough Frost. (Transmission not available). A good medium cosmetic diffuser. (Transmission not available).